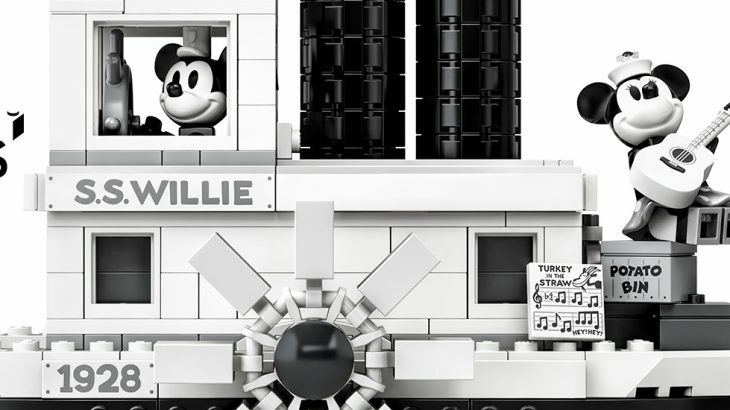 [18th March 2019] Celebrate the 90th anniversary of Mickey Mouse with the LEGO Ideas: Steamboat Willie. This brand-new set showcases the historic animation by Walt Disney that was the first of its kind to feature synchronized sound. This iconic piece of animation history has been lovingly recreated with a premium monochrome colour scheme, complete with limited edition packaging – making this a true must-have for any Disney collector. 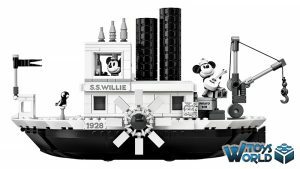 Brand new minifigures, Mickey Mouse and Minnie Mouse aboard the SS Willie featuring a working crane, steam pipes and spinning paddle wheels. This set lets you play out classic scenes from the original Mickey Mouse short or is perfect for display in any room. Also included is a miniature version of Minnie Mouse’s guitar and her music sheet that was shown in the 1928 animation. You can even recreate Mickey peeling potatoes after he was told off by Pirate Pete. This set is the ideal LEGO set for adults to relive their favourite scenes from the classic cartoon or for kids to own their very own piece of animation history. The boat’s bridge has space for a Minifigure, a brick-built bell as well as authentic details such as the ships wheel and the life buoy. 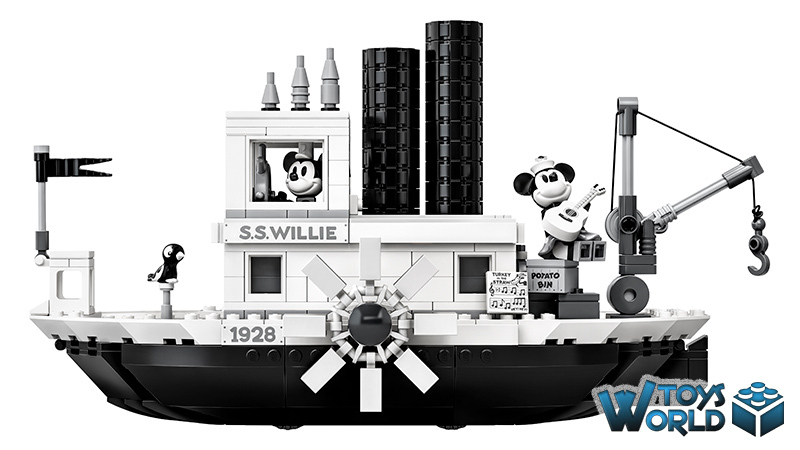 The boat comes with an ‘SS Willie’ sign as well as a ‘1928’ sign honoring the cartoon’s debut. The set also includes a booklet with fun facts about the historic animated Disney short film ‘Steamboat Willie’. 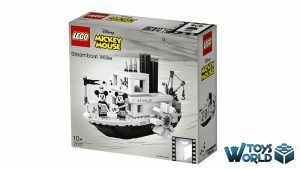 The LEGO Ideas Fan Designer for Steamboat Willie was Máté Szabó from Budapest, Hungary who was inspired to design the set having grown up with LEGO since the age of 3. LEGO Ideas offer fans the opportunity to submit their own brick creations to be in with the chance to have their concept brought to life with the help of LEGO master designers and a share of the profits. 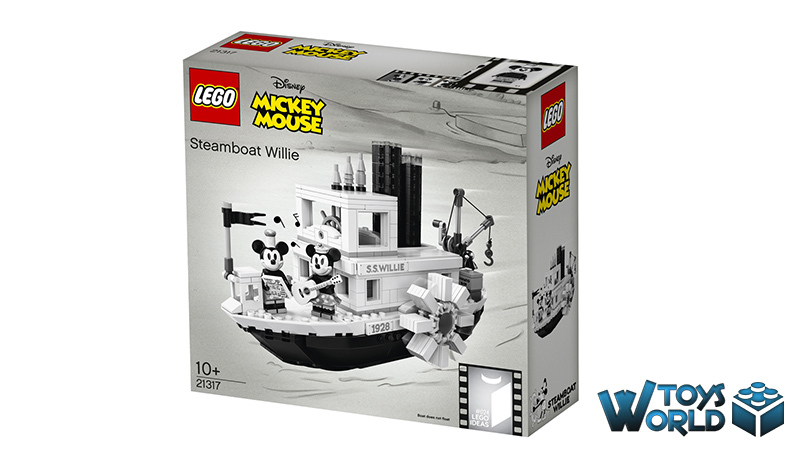 Featured, LEGO, News & Features 21317, LEGO, LEGO Ideas, Steamboat Willie. permalink.